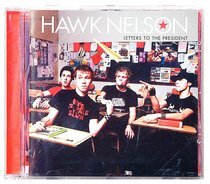 Straight out of Canada with big guitars, driving bass-lines, and catchy-as-anything melodies comes the energetic punk-rock foursome, Hawk Nelson. The band recorded this debut album at The Compound in Seattle alongside producer Aaron Sprinkle (MxPx, Pedro the Lion) and Trevor McNevan (Thousand Foot Krutch) in February 2004. About "Letters to the President"